Welcome to the Stony Brook University Undergraduate Bulletin Online, the official Undergraduate Bulletin. The online Bulletin is updated on a regular basis. Historical versions are archived once per year in pdf format. 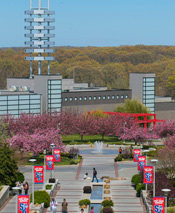 For general information about Stony Brook University, select OVERVIEW in the above navigation, or select POLICIES & REGULATIONS for detailed information concerning degree requirements, financial aid, academic programs and more. PROGRAMS & COURSES provides details on majors and minors, as well as course descriptions. The information in this publication is accurate as of March 15, 2019, unless otherwise noted. Students are responsible for reviewing, understanding, and abiding by the University's regulations, procedures, requirements, and deadlines as described in official publications. This includes, by way of example only, this Undergraduate Bulletin, the University Conduct Code, the Student Handbook, and class schedules. A printable version of the Bulletin is available in pdf format. The overview, policies & regulations and academic programs are available here or choose to print all course descriptions. To open the PDF files, you may need to download a free copy of Adobe Acrobat Reader.